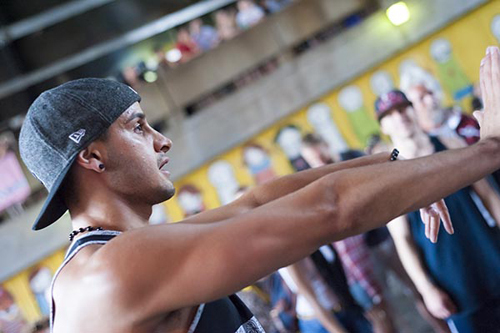 Hundreds of people of all ages took part in – and thousands watched – two hip hop dance events in London this summer, organised by producer Kate Scanlan and her company Scanner’s Inc. Words & photos (see full gallery below) by Carole Edrich. After breaking circles with Pervez of Live 2 Break Crew was an all styles concrete jam where the final winners were decided by the loudness of the audience’s roar, Elaine and Sharifa (on this sunny Sunday of Love surnames didn’t seem to matter) Mouse from Hammersmith suggested that he share first prize with the much younger Joel rather than letting the audience make a decision between them. DJs Billy Biznizz and Ty maintained the good vibes with a final two hour social dance party. I heard one dancer say to another in jest “age is catching up on me, I danced so much I nearly had a heart attack” as the already-busy concrete dance ground filled to bursting point, while a fascinated and very appreciative audience of several hundred passers-by looked down from the bridge and the ramp. “I really am overwhelmed by the response and my face hurts from smiling so much,” said Kate Scanlan afterwards. I asked her what we could expect next year. The answer’s more of the same, and it’s already looking really good. Artists who took part in The Bridge included: Billy Biznizz, TY CHikioke, Breis, Pervez, Andry Oporia, Sarah Love, DJ Jam Fu, Jutsu Hok, Samantha Haynes, Rajib ‘HOlistik’ Manandhar, Kendra J Horsburgh, Sheila Attah, ASTEK, Mr Dane. The second in what London’s hip hop community is united in hoping will become an annual event, it features Popin’ Pete, DJ Biznizz and Mr Dane. One of the originators of the dance style (although he always points out that he was inspired and learned from his brother ‘Boogaloo’ Sam Solomon) he is a first-generation member of the Electric Boogaloos. With a career spanning over thirty years since the first emergence of popping dance to the development of funk culture (and integration of popping into it). 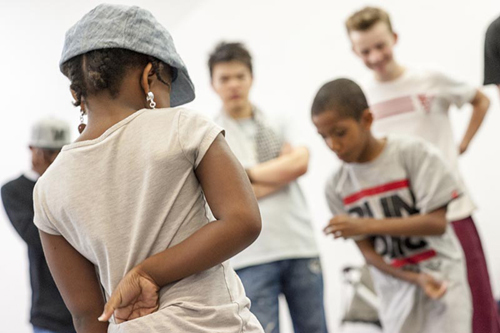 Hip hop, popping and boogaloo are now so embedded in the culture that fathers, mothers and children still in primary school attended Popin’ Pete’s workshops and the socials that came with it. The event is extremely popular as is demonstrated by the lengths people will travel to attend. I met a lady from Edinburgh, a couple from France and a Londoner who had cut his holiday short to get back for it. This is partly because of Popin’ Pete’s clear, patient teaching style – and also because it’s a pleasure to learn from someone who has stayed grounded despite his success. As ever, Pete was happy to share his experiences as he grew up, as well as the dance. I particularly like Pete’s lessons because he is clear about the basics and expects people to master a move before tweaking it to make it their own. 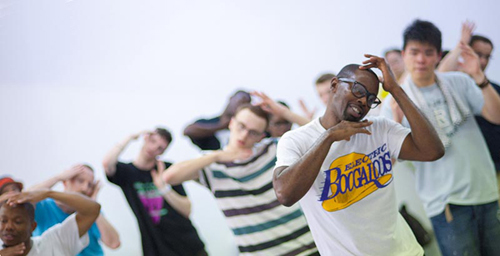 It’s the Electric Boogaloos who choreographed Michael Jackson’s Thriller and Beat It videos, and Popin’ Pete has gone on to innovate styles that include crazy legs, ET, spider man and sleepy style – all of which he was happy to teach so his visits to England are always well attended. 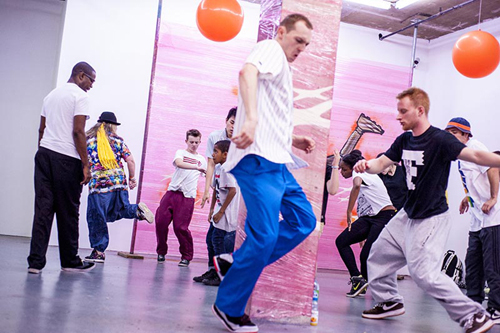 Other artists who took part included London poppers Dickson Mbi (FIYA House Crew / Russell Maliphant Company); Vicky ‘Skytilz’ Mantey (Boy Blue Entertainment) and Boogaloo Sam.